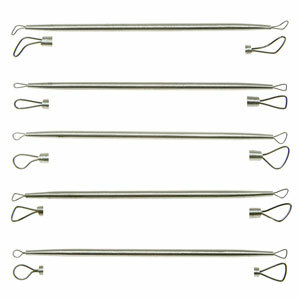 Also known as Thin Line tools, the 608AZ set of five mini steel detailing tools is an asset to any sculptor. Each double wire end tool provides the artist with the ability to add fine details on faces such as irises, incised design and sgraffito which is popular in painting and ceramics. Their uniquely-shaped cutting ends allow for precise sharp clay modeling. Equally fine for pottery clay and wax. Approximate length of each tool: 6".